Love them or hate them, dog collars are an essential part of every dog and dog owner’s life. Not only do they provide a medium to attach a leash to, but they also serve as a convenient means to identify pups in case they wander away. The utmost care must be taken when embarking on the search for a suitable dog collar, most especially because a good collar could make all the difference in a sticky situation. All in all, to guide you on the road to making this highly sensitive decision, here is a comprehensive list of the best dog collars currently on the market. The domestication of animals has been going on for quite some time and as such, it is no surprise that the use of dog collars date back all the way to predynastic Egyptian times. These simple accessories were fashioned from leather and precious metals and were solely meant to be decorative. Though the same sentiment is used in the modern version, a whole lot has changed since then. The Warner Brand Cumberland Leather Dog Collar with its free engraved brass ID tag is a lovely handcrafted collar that is not only pleasing to the eyes but functional on every level. This is one of those leather dog collars that is made to suit medium to large dogs; it measures an inch in width and as such, would not be the best choice if the neck of your dog is less than 15 inches. Apart from the brass ID tag, the collar is also fitted with a nickel-plated D-ring which is a handy avenue for you to connect a leash. One great thing about this dog collar is that the more it is used, the more comfortable it begins to feel. Before you know it, your pup will be unaware of its presence. For further comfort, it is recommended that you try to match your dog’s neck with the center hole bearing in mind that the collar is equipped with 5 holes that are an inch apart. Though it is a highly functional accessory, there are no laws against a dog collar being trendy and fashionable. That is no doubt one of the foundational concepts behind the creation of the Blueberry Pet Classic Solid Color Collection. This can be classified as one of those cool dog collars that are meant to be used on a daily basis. The unique hue of the collar itself is inspired by the warm weather and carries an air of elegance and simplicity that is altogether unrivaled. Taking the fact that it is made to show off your pup’s style, the dog collar is available in an array of colors such as royal blue, dark orchid, Florence orange, neon green, French pink and medium turquoise. It is made from a nylon fabric that is equipped with high-density webbing which adds that touch of durability that you need. The attached buckles are made from solid eco-friendly plastic and the metal D ring is chrome coated which is also for durability. While trying to get the right fit, note that this is one of those cute dog collars that does not stretch itself out. To properly deal with that, one needs to leave 2 fingers between the collar and the dog’s neck for their optimum comfort. 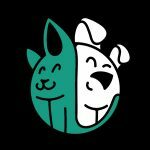 In the heart of Rochester, New York, this next brand has built its whole reputation on the notion that training does not have to be a negative experience for you and your pet. Their love for dogs led them to create the Mighty Paw Martingale Collar and as a result, they revolutionized the training process. So how exactly does this collar work? It makes use of uncontrolled force to curb negative behavior in dogs. It does this by tightening once under tension, nevertheless, it does this by minimally delivering controlled training in order to prompt your pup to behave. It may sound a bit too much, but this collar is actually a go-to option for trainers and professionals because of its gentle nature. It is made out of premium quality nylon bound together with reflective stitching to help keep your pet visible even when the sun sets. 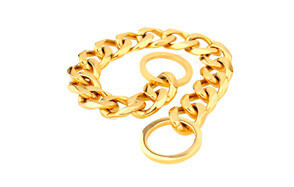 The addition of a 100% iron chain will help give that extra durability, functionality and of course aesthetic appeal. The presence of the iron also helps to create a sound that makes the training more wholesome. As a bonus the leash comes with a single-piece D-ring so you can easily make the switch from a training collar to a good old standard collar. The GoTags Personalized Dog Collar is a solid example of how the concept of pet identification has been upgraded. The first moment you lay eyes on these personalized dog collars, it is evident that they can easily serve as a great way to identify your pet. This sturdy nylon contraption is delivered with your dog’s name and your phone number permanently stitched into it. The size of the embroidery is a perfect size, no one has to squint or lean in to get the total gist of it. Additionally, the embroidery comes in 15 different colors, nevertheless, it should be noted that the personalized text is limited to 25 characters, spaces included. The material used to make this personalized dog collar is a stellar nylon webbing accompanied by a stainless-steel D-ring as well as a secure plastic side release buckle which makes for the smooth one-handed quick release. So that it is more comfortable for your canine companion, the nylon features smooth and tapered edges. All in all, this is one of those cool dog collars that is made to last. When searching for a dog collar, finding one that your pet can grow with is equivalent to hitting the jackpot altogether. Most dog owners have to go through the perils of finding a dog collar for every development stage in their pet’s life, but with the Nylon Prism Snap-N-Go Collar by Weaver that issue is a thing of the past. Weaver as a brand that builds its whole reputation on providing collars that are altogether designed to be comfortable for both dogs and their owners. This can be classified as one of the best dog collars out there because it definitely lives up to that standard. 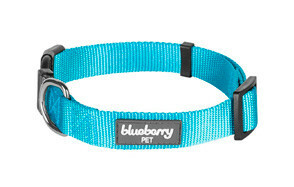 The collar itself is made of high-quality single ply nylon sprinkled with a burst of color. In order to make it more durable, this collar is reinforced with box-stitching at its stress points. So, your pup has the liberty to be as active as can be without it telling on the collar in the form of wear and tear. An important fixture in the overall design of this collar is the black plastic slide and keeper which makes it possible for users to adjust it to a number of sizes. This is what makes it a great option for growing puppies; so, in case you are in the market for puppy collars, small dog collars and even adult dog collars, this is a viable option. It is undoubtedly clear that dog collars have come a long way and judging by the current market, the change is not over yet. Nevertheless, there are some stellar products that are already practically dripping with perfection. One of such products is the chede Luxury Real Leather Dog Collar. The brand as a whole has been dedicated to putting out quality product since its inception, the fact that it is both handmade and hand stitched speaks volumes. Another testament to the great quality and design of this collar is the fact that the inner part of it is padded and as such your dog’s neck is protected from any rubbing and resulting irritation that usually comes with dog collars as a whole. You can rest assured that there are no shortcuts taken with this contraption, it is made to function as an extension of your dog and not just an attached accessory. Also, this qualifies as one of those leather dog collars with a difference, it is crafted using high-quality real leather which is quite sturdy yet gentle for the comfort of your pup. There is also the addition of strong and beautiful metal that is used to fashion the buckles and other metal components. To crown it all up, it is very easy to clean this collar, all you need is a soft damp cloth and some good old leather cleaner. Using collars mainly for the aesthetic appeal is not a new trend, as aforementioned, since the days of pre-dynastic period, Egyptians have been placing decorative collars on their canine companions. This concept forms the basis upon which the W&W Lifetime Custom Ultra Strong 19MM 14K Gold Plated Slip Chain Dog Collar was created upon. The collar itself is made of solid 316L stainless steel metal which is as durable as they come; it will not rust and as such is highly unlikely to tarnish or irritate your dog’s skin. 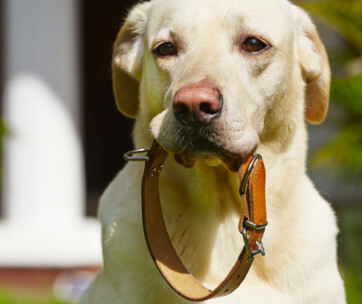 Seeing as dog collars in the form of jewellery are becoming increasingly popular, there is an unlimited supply of such products on the market today. The issue is that most of them are made for smaller dogs, this is not the case with this stainless-steel contraption. It comes in a heavy-duty design that will make your large dog look downright cool. It is a sturdy and durable choice, yet it offers your pup the stylish comfort they deserve. It can be worn for hours without causing the slightest discomfort and it helps that it does not do anything to ruin your dog’s coat as a result of it digging into the skin. This collar is not only aesthetically pleasing and sturdy, it also serves as a training collar. Its smooth and comfortable links will in no way damage or yank out the fur on your dog’s neck. It is definitely a premium product. The only thing that is better than a man or woman in uniform is a dog in a military style dog collar. Not only is this an essential dog product for every pet parent, but it is a top-notch product and as such, the OneTigris Military Adjustable Dog Collar is a great choice for you and your canine companion. The overall design of this collar screams vintage, functional yet fashionable; in addition to this, it adopts a sharp military style. It comes in the form of a flat collar equipped with a soft cushion padding which is not only there for your dog’s comfort but also to prevent any skin irritation and tarnishing. It is characterized by a hook and loop lapel which makes for a convenient medium for you to add military patches for that extra ‘oomph’. It also comes with durable webbing that honestly makes all the difference in terms of sturdiness. On the collar itself, there are 5 adjustable points as well as a heavy-duty metal D ring and a belt buckle that can be used to easily attach a dog leash. All in all, this is one of those cool dog collars that will not only keep your dog safe, but it will keep them comfortable and stylish. Being patriotic is more of an internal function but that does not take away from the fact that it is great to show it on the outside as well. Over the years, a number of clothes, accessories as well as some selected items have donned the American flag in respect and reverence; this is the premise on which the American Flag Dog Collar is based on. Once your dog puts on this stylish accessory every day is as festive as the 4th of July. With its strong polyester webbing, its durable quick-release plastic buckle, and a heavy-duty zinc alloy D-ring with a reflective logo this stellar accessory is a great choice to make when it comes to collars. The collar itself is available in 5 different sizes ranging all the way from teacup dogs to dog that weigh up to 140-pound dogs. Altogether, they are designed perfectly based on the width and length to fit all breeds of dogs out there. These collars make for different widths to be paired with sizes and as a result, it is not bulky, stiff or heavy when fitted on smaller dogs. This alone provides your pet with the sense of a personalized experience. Despite all this, it still maintains the same strength and durability no matter the size it comes in. So, let your pet show his or her love for all things American while donning this spectacular collar. 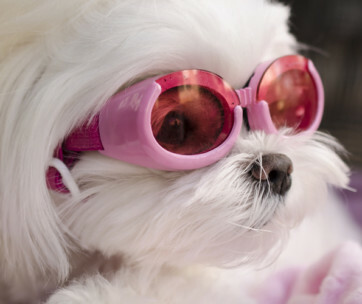 With the advent of sustainable living and the green movement as a whole, dogs and dog lovers alike are switching to products and accessories that are more on the eco-friendly side. With the Taglory Genuine Leather Dog Collars, you can rest assured that is made based on these ideals. It would please any dog owner to know that this collar is made of genuine full grain leather which is the best way to go if you and your furry companion often hike, take long walks or indulge in any activity that allows your dog to roam about at will. It is notable that the leather used here is solely vegetable tanned leather due to the fact that it is free of chemicals and is less prone to cause any allergies. The leather itself has a light pull-up as well as a mellow supple tannage which makes it easy for it to withstand dogs that are up to 150 pounds. The overall design is both classic and practical that also makes for a comfortable pull. To crown it all up, vegetable tanned leather is known to become more aesthetically pleasing over time, so expect your collar to keep getting better with time. This is one of those leather dog collars that is fitted with a conveniently placed alloy D-ring as well as an additional ring on which you can attach an ID tag. All users should rest assured that the intricate production process of this collar ensures that it is a safe and durable option for dogs everywhere. There is no doubt that choke collars have gotten their fair share of bad publicity, dog activists and dog owner alike are quick to frown upon this form of restraint. Nevertheless, there are some select versions out there that are near perfect and should definitely not be considered by pet owners, trainer, and lovers. One of such products is the Coastal Pet Chrome-Plated Chain Choke Training Dog Collar, there is no doubt that it is a safe and humane mode of training dogs everywhere. This is a dog collar that is well known for its gentle control even though it comes in the form of a heavy-duty chain. The fact that it is argon welded and chrome plated adds to its overall durability and strength, so say goodbye to rust, breakage and other metal related issues. There are a number of professionals out there that give this product their total support, so you can rest easy knowing that it comes highly recommended. Note that for the safety of your canine companion it is highly recommended to use this only when the dog is on the leash to avoid any accidents. The fact that the words ‘rhino’ and ‘comfort’ are used together in the name of this dog collar may seem a bit contradictory, but sometimes two totally opposite concepts can merge together to create perfect harmony. With the Black Rhino Comfort Collar Ultra Soft Neoprene Padded Dog Collar, you can expect a product that is both heavy-duty, yet lightweight. The overall design of this collar is as lightweight as they come but this does not negate the fact that it sturdy enough to hold its own against an active or big dog. The addition of the neoprene padding is key, as it provides dogs with an extra measure of comfort. To this effect, each collar is lined with this material so as to protect your pup from irritations and other collar related discomforts. An added advantage of this collar is the fact that it easily dries and is odor resistant, as such your dog can play in the water as much as they want without paying the collar any special attention. For dogs that are still active when the sun goes down, the reflective stitching is perfect. All in all, this is a collar that has all grounds covered. Some people have never caught a glimpse of these collars and a select few are firm believers in the fact that they originated from the cartoon Tom and Jerry. Nevertheless, these contraptions date back to a simpler time when dogs were used for herding and the spikes were there to keep wolves from going for the jugular. The situation may not be the same in the present day, but it does not change the fact that the Beirui Sharp Spiked Studded Dog Collar is a stellar dog accessory. This is one of those spiked dog collars that is made out of hick and soft leather. This undoubtedly works to your advantage especially in the case that you are the pet parent of a big dog. Though in present days, we try our best to keep our pets safe, you never know when things may get a bit violent, in that case, you can rest assured that your pet will get all jacked up before you even make a move. In addition to all this, it is fitted with a heavy-duty D-ring that is strong enough to hold its own while you walk your dog. On a final note, it is important to note that this accessory is not safe for use while your dog is playing with your children. You will not find a fancier collar that is equally functional and sturdy. Whether you are in the market for girl dog collars, boy dog collar, cat or dog collars, the Lionet Paws Dog Cat Collar Bowtie is more than enough to satisfy all your collar needs. Every single one of these accessories is made with 100% cotton designer fabric and comes in a number of sleek styles that will make your furry little companion look as fashionable as can be. The attached buckles are made of high-quality stainless steel and the accompanying D-rings are welded on in order to improve the overall stability and durability. Getting the perfect fit is not something you need to worry about with this collar as it can easily be adjusted for comfort and also be attached to a collar of your choice without any alterations to the collar itself. The amount of detail that is put into the making of these contraptions is impeccable, the bowtie is hand sewn and attached to the collar with the use of a plastic strap. Be sure to keep it in mind that you cannot machine wash these collars and that they should be washed with mild soap and rinsed with water. At the end of the day, going back to the classics may be the best option after all. With its rustic look and altogether efficiency, the Hide & Drink Rustic Leather Dog Collar is a great choice for any dog owner on the lookout for a practical dog collar. It is simple yet stylish and a great example of how ‘less is more’. The fact that is handmade puts it on a level of its own, in addition to this, it is sturdy and durable, made with full grain leather, which is the crème de la crème of leathers. Its overall design features double stitches which will ensure that it can hold its own against wear and tear. It is also fitted with rustic metal hardware such as the of the highest quality and as such your mind can be at peace when your pup is using this collar. Dog collars are accessories that every dog owner will surely make use of from time to time and as such the decision of which one to purchase should not be taken lightly. Seeing as there are a number of dog collars on the market here is a comprehensive guide on how to obtain one of the best ones out there. It is key to take into consideration the size of your dog when searching for a dog collar, not doing so could result in some pretty heavy regrets. In most cases, light yet sturdy collars are more suitable for small dogs because their weight will not raise any issues. On the other hand, large dogs should be paired with a more heavy-duty option is suitable so that the collar does not break away easily when your dog pulls away. Whether your dog is trained or not, this basic formula should help guide you to the best option. 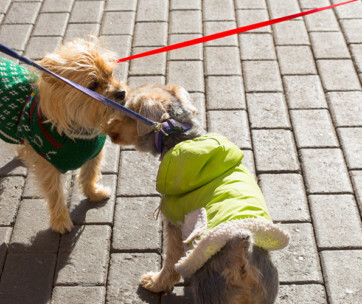 Dog collars can be used every day but in some cases, they are solely for outdoor use. You need to determine which capacity you will be using it in so as to get the best out of the collar. In the case that it is meant for everyday use, be sure that there is an avenue for ID tags to be attached. It should also be a flat-buckle adjustable collar made of materials such as leather, nylon or cotton and well fitted to the neck of your dog to avoid chewing. Outdoor collars need to be as sturdy and durable as possible, with quick release snaps. Collars come in an array of materials some of which are leather, nylon and metal. If you own a growing puppy then leather is probably a very impractical choice because it is pricey, and your pup will grow out of it fast. Nevertheless, it is a good choice for an active adult dog because of its sturdiness and longevity. Nylon collars are a bit more affordable, yet still sturdy enough to function well, this is more suited for growing pups. Metal collars are mainly purely aesthetic. In the case that your dog is has a hairy coat then his/her collar should not be fitted or decorative to avoid tangles, injuries or infections. Similarly, if you have a pup that is incredibly active then a fitted collar is the way to go. Take it into consideration that some dogs get in sticky situations while playing and as such a breakaway collar is a great choice. Non-active breeds can easily sport jeweled or decorative collars because they are less prone to have accidents. Dog collars can be used for a number of reasons, some of which are identification, aesthetic appeal, control, and protection. This is the most common type and can be seen on dogs everywhere; generally, they come in a wide range of sizes and are made from materials such as leather, nylon, metal and even hemp. 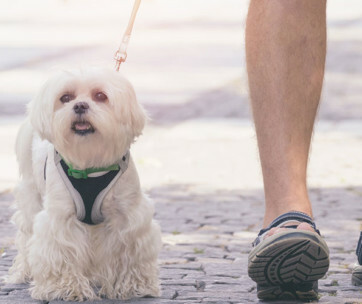 They usually make provision for dog tags to be attached as well as leashes in the case that you want to take your pup for a walk. As a general rule of thumb, lightweight collars are more suited for puppies and small dogs while the heavy-duty ones are best used on larger, more active breeds. Also commonly referred to as slip chain collars, these are usually made from chained links that have two rings situated at each end and one end slipped into the other. These types of collars are usually utilized for training purposes because of its affordability and sturdiness. Nevertheless, it has faced a whole lot of criticism due to the fact that it is tagged as an inhumane training collar. Dogs using these collars need to be under constant supervision to avoid accidents that may lead to serious injury or death. If collars had personalities, this would be the life of the party; they are fun, often heavily decorated and made for special occasions. They are generally not known for their sturdiness and durability and as such cannot be used the same day an everyday collar is used. First, be sure to set realistic expectations, the collar cannot be the only mode of training for your canine companion. 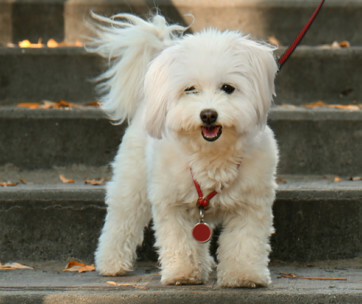 Explore other options that your dog will be more responsive to. In the case of puppies, introduce the leash gradually, start in the house where you have more control of the situation then graduate to the great outdoors. 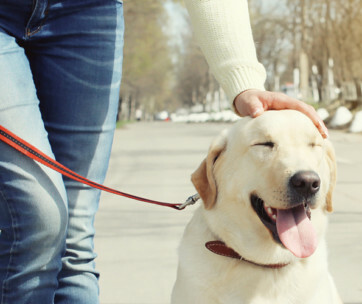 If your dog is getting stressed out with the attached leash, place treats ahead of them as a form of positive reinforcement. Q: Do collars hurt a dog's neck? A: It depends on the type of collar, in the case of choke collars, the right amount of stress and resistance could cause discomfort. On the other hand, breakaway collars simple detach when the pressure is too much for the comfort of your pup. Q: How do I know what size to buy my dog? A: With your measuring tape, take the measurement a few inches below his/her head and be sure to add an extra inch for small dogs and two inches for medium and big dogs. Based on the measurement, you can find the closest fit on the size chart. Q: What's the best sort of collar for an active dog who often gets wet and muddy? A: By far the best for all this is a nylon collar, not only is it affordable, and it also has the ability to handle water quite well and it is easy to clean. Q: Does metal hardware use to make these collars get hot in the summer? A: This should never be the case, if the metal hardware installed on the collar heats up due to the weather it is manufacturers fault for using inferior products. Q: Should I buy a leather collar for my puppy? A: No, leather collars are pricey, and your pup is sure to grow out of it quite fast. This is one of those dog collars that is both aesthetically pleasing and highly practical. Though it suits mainly medium to large dogs, it is not a rigid product. 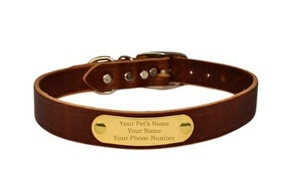 It is fitted with an attractive engraved brass ID tag and you do not have to pay extra to get your pet’s name etched in. That is not the only metal fixture, it is also fitted with a nickel-plated D-ring for leash attachment. The durability of this contraption is unquestionable, in fact, it gets better with time. All in all, it is a great investment in your pet’s wellbeing.